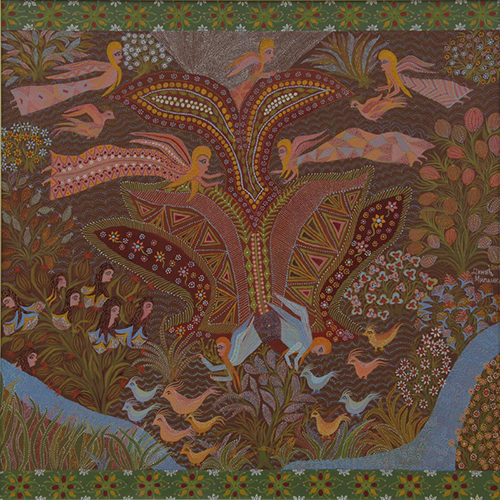 Description: A unique blend of elements of folk, naive and outsider art. The original combination of real and the unreal creates a fantastic summary. Metamorphoses, multiplication of various shapes, reflecting the original contemplation of the artist built a strange world of her visions, those in which we are angels, as higher beings monitored. Ornamental decorative arabesque as if the scenes of unusual elements connected to yet more obscure size, the fruit of exceptional artistic sensibility of the artist, and yet the whole work exudes exquisite harmony. The fear of empty space only increases the intensity of the motive of the artist.